Campaign: The campaign was to increase mobile club sign-ups. This campaign was to provide all mobile club members an offer of 10$ off any 50$ or more purchase. Duration: Beginning on January 18, 2017, the campaign is still in effect. Objective: Appleton Harley-Davidson out of Appleton, WI set out to increase mobile club sign-ups by 150% through an incentive promotion. Strategy: To increase mobile sign-ups, 7 Media Group and Appleton Harley- Davidson teamed up to offer every mobile club member to with a redeemable coupon. 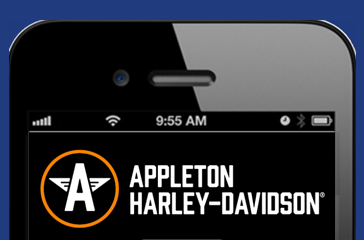 Results: Since January 18, Appleton Harley-Davidson has far exceeded their goal of an increase of mobile club sign-ups. Schaffer replied, “We far exceeded our goal of 1,000 mobile club members. We currently have over 1,700 people and have redeemed over 50 coupons.” As the numbers continue to pour in daily from the benefits of the campaign the growth of sales and sign-ups are continuously increasing. Testimonials: So Why Media 7?